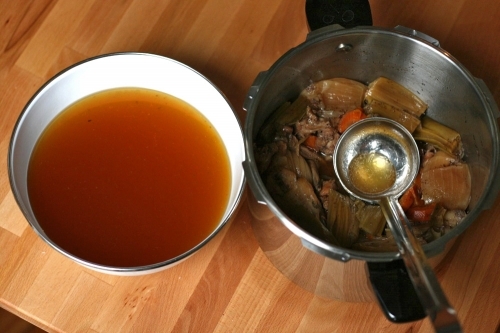 Interesting post over at the Paupered Chef - "How To Make Superb Chicken Stock In About An Hour". What's interesting is that he argues, via a recipe by Heston Blumenthal, that chicken stock should be made in a pressure cooker rather than slow cooking in a pot. It is both better and quicker. And the reason it is better is because it creates a Maillard reaction. I thought this was a unique insight. Because I always think of that reaction as occurring on hot dry (or oiled) surfaces. But there is no reason the reaction cannot occur in water. All you need are heat, proteins, and a reducing sugar. In fact I would venture that adding a little bit of sugar to the stock ingredients would help although a mirepoix brings some of these sugars. The proof is in the pudding (stock). I tried it out this weekend with noticeably better results than I usually get. And take a look at a picture of his results. My stock was also noticeably darker suggesting that the reaction did occur. Awesome stuff.